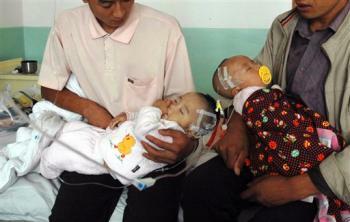 According to the AP Newswire 432 children in China have been sickened by infant formula tainted with Melamine. There is one confirmed death. Apparently, a Chinese dairy that sold milk powder linked to kidney stones in infants knew it contained melamine. They failed to recall the tainted milk products because, “grocers wouldn’t return it”. Uh, okay? I kinda don’t get that either. In any event. If you or anyone you know and love shops at an ethnic market with any regularity (I do!) please pass this important information along. Although much of the tainted formula has been seized, and many executives are in custody (Yes they did this on purpose) some might have made it’s way to other countries. Cuz, ya’ know, the guys who add deadly chemicals like Melamine to milk in order to turn a profit aren’t all that concerned about customs laws either. The official Xinhua News Agency reported Saturday that the dairy, Sanlu Group Col, was ordered to stop production as the number of sick babies rose to 432. A Health Ministry statement gave no indication why Sanlu Group Co., China’s biggest milk powder producer, failed to warn consumers immediately. Employees who answered the phone Saturday at the ministry’s news office and at China’s product safety agency said they had no more information. In August, Sanlu’s testing revealed melamine in the milk powder, a ministry statement said. Melamine is a toxic chemical used in plastics that contaminated pet food last year. Remember when the puppies died and everyone was outraged? Please, let’s pay attention to what we put into our children’s bodies too. Tell a friend. This one matters. If you think you can buy anything “Made In China” and still be green, think again. Thanks for posting this. I might be naive, but I think it’s amazing that there are people out there who would knowingly allow this to happen. Bad. Bad. Bad. Wow. This is scary. I’m glad you posted this, hopefully the contaminated formula didn’t make its way to the Asian Markets in the U.S.
Another good reason to breastfeed! it is almost like China will stop at nothing to kill it’s own people. I am currently living in Sicily and my neighbor has had a baby on formula for 2 months now (after 4 days of trying to get milk the Dr. told her to formula feed and advising not even trying both -I tell you Sicilians do not have good education system, they are kind, loving people but not all there intellectually) and since this time Anita has upset tummy aches and literally cries all day. I suggested to change the formula but her Dr said no…??? If it were my baby, I’d try to make her as comfortable as possible…even if it meant finding another woman to give milk to her/him. This is incredibly scary and makes me happy that I breast fed my children until they wanted to stop. I recently watched a programme about wet nursing and whilst I was uncomfortable to start with – the idea of another woman feeding my child was just not the norm – by the end of the programme I quite understand why many people nowadays are choosing this option rather than sing formula. Thanks for sharing this story, Jessica. Could human beings seriously do this on purpose just to make their money go a little further? I read further on CNN and BBC and got a little teary. It is crazy. Do you think these people completely lack conscience? (Or is it a sinister way of enforcing China’s “one child” policy. . .)? Did you see the new numbers on this? Over 6000 infants ill and at least 3 dead. With over 20 companies in question parents in China who have decided not to breastfeed must be at a loss for what to feed their babies. Does anyone know if breastfeeding is common in China? Tara, I’m loathe to call out any mother for not breastfeeding. I had one child who I breastfed exclusively (not my choice) and another who howled uncontrollably when I cradled him to nurse. We later found out there were very good medical reasons that breastfeeding was impossible (I owe you a post). I don’t know about Chinese customs regarding childcare, but I do find myself very interested now. I have to hold back tears thinking about what mothers in China are going though. Karen, I remember the Mexican candy scare. Sadly, I still eat a good portion of my meals off taco trucks and other various street vendors. Chinese mothers have babies and then promptly pass them on to the grandparents to rear when they are very small so never have the opportunity to breast feed their own Children! I am working in a supply chain and i know as a fact that powder milk from China is used in US for confectionary and other food production (frozen, icecream, etc) It will take us some time to acknowledge the problem as content of the milk in a cookie is much less than in formula, but if you consume it regularly within several years, you gonna have kidney stones. What can I say, corporations are to be blamed for letting it happen, and a lack of government control and regulation as usual. They should test all ingredients from China before to put it into production… (not only once a year). Very sad. not surprising. People would do anything just to get what they want even if it means hurting other people not to mention babies. Simply selfish and demonic. heartless individuals! and in case they do have a heart, it’s probably freezing ice cold and twisted into a pretzel. The world is getting more chaotic everyday. be informed on updates which food lines and brands are contaminated. Warning: it includes most of the favorite snacks such as M&Ms, Cadbury, nestle, oreo, etc. Good thing that I don’t use milk powder.